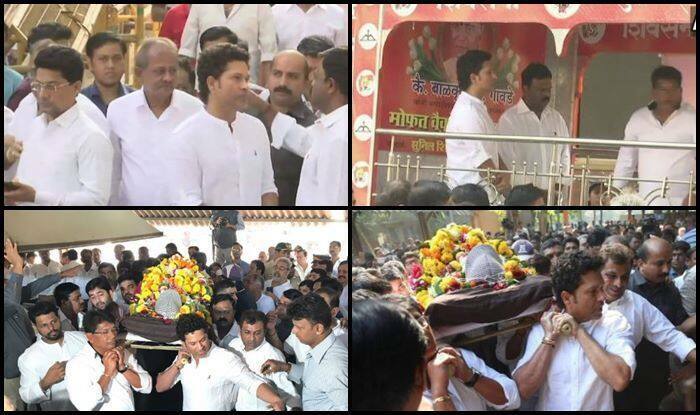 Renowned cricket coach Ramakant Achrekar, who died due to age-related ailments, was cremated here on Thursday with his most famous ward Sachin Tendulkar in attendance for a tearful adieu. Renowned cricket coach Ramakant Achrekar, who died due to age-related ailments, was cremated here on Thursday with his most famous ward Sachin Tendulkar in attendance for a tearful adieu. Archrekar, the childhood coach of Tendulkar, passed away at 87 on Wednesday at his Shivaji Park residence in Dadar in Central Mumbai. His body was kept at Shivaji Park, where he coached aspiring cricketers and then taken to a nearby crematorium. When the body was taken outside the ground, young boys, who practice there, gave a guard of honour amid chants of ‘Amar Rahe’. Tendulkar, along with Achrekar’s other wards like Vinod Kambli, Balwinder Singh Sandhu, and Chandrakant Pandit, took part in the procession to the crematorium, where his body was consigned to flames. Earlier, the body was kept at his residence for people to pay their last respects to the Dronacharya and Padma Shri award-winning coach. Mumbai cricketers such as Atul Ranade, Amol Mazumdar, Ramesh Powar, Paras Mhambrey, Ranji coach Vinayak Samant, Nilesh Kulkarni, Vinod Raghvan, were also there along with fans. Former Rajasthan coach Pradeep Sundaram, office-bearers of the Mumbai Cricket Association, veteran cricket administrator Prof Ratnakar Shetty also paid their last respects. Among politicians, Maharashtra Navnirman Sena chief Raj Thackeray, MLA and BJP leader Ashish Shelar, Mayor Vishwanath Mahadeshwar also paid tributes to their coach.